Islam is a religion practised by over a billion people and Muslims are followers of the faith. The ninth month of the Muslim calendar is the holy time of Ramadan, when Muslims all around the world fast for a month. By avoiding food and water from dawn until dusk, Muslims look to fulfill one of the pillars of Islam. (The five pillars of Islam are five basic acts in Islam that are considered mandatory and are the foundations of Muslim life.) After resisting temptation and fighting inner demons, they are then rewarded with Eid (or Raya), a month filled with food, forgiveness and celebration. As it is a big occasion in countries all over the world, Eid is observed in tandem with the country’s specific culture. In Malaysia, where I come from, the event is a huge deal. Preparations can even begin from the second week of Ramadan. It depends on how much money you’re willing to spend, but some families go all out and make their Eid clothes or kuih (koo-weh). Some even give their living room a makeover: new curtains, new cushions, new furniture, new paint, the whole she-bang. Others choose not to be too grand in their Eid preparations. What do we do during Eid in Malaysia? The night before Eid, Muslims in Malaysia watch their TV sets and await the Eid announcement after Maghrib prayers (second last prayer of the day). Once it is announced, a takbeer is heard in the nearby mosques and various TV channels. It is a proclamation to prevent Muslims from becoming too prideful and to remind themselves that the month of Eid is a blessing and a reward from Allah (the Muslim god). On the first day of Raya, Muslims go to the early Eid prayer at the nearest mosque. Then, they return home to the delicious home-cooked meals that have been prepared that morning or the night before. Raya is celebrated with immediate family members first, then with other relatives and/or friends. After breakfast, we have a “forgiving session” where family members take turns apologising to each other for any mistakes made or harsh words spoken. Usually, the youngest will ask for forgiveness from the eldest and move down the age line. The reason we do this is because Eid is the time of forgiveness and renewal. A common phrase used during this period of the year is kosong-kosong which translates to “zero-zero”. It means that all past mistakes are forgotten, and we begin our relationship with each other fresh and new for the rest of the year. Families usually go to each other’s houses to visit, reconnect and eat. So people who you haven’t seen in a long while or have never even met before may pop up at your home. But, in the spirit of forgiveness and Eid, you greet them with a smile and open arms. At the end of the visit, the adults may give out duit raya, money in individual packets, young children, students, the elderly and orphans. The amount will vary depending on each family and each person. The packets are either bought or received for free from various institutions like departmental stores or fashion boutiques. The more relatives you visit, the more delicious food you get to eat and the likelier it will be to get money as well! What do we wear during Eid? In Malaysia, we wear our traditional clothes during Raya. Women wear baju kurung or baju kebaya that can be ready-made or tailored. 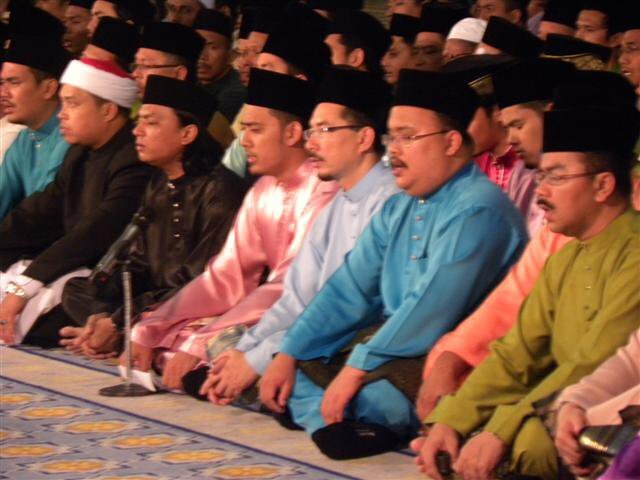 Men wear baju melayu with sampin and songkok. Though recently, women may be seen wearing long dresses known as Judah or abaya that can have a variety of designs and colours. However, it isn’t usually considered traditional Malay clothing, but Arab. Since it is encouraged to dress nicely and wear new clothes on the first day of Raya, many people are eager to prepare in the days leading up to it. Some families may even decide to coordinate their Raya clothing. There’s a sudden surge of shoppers at various malls selling traditional materials, new designs pop up (ranging from affordable to expensive), discounts are offered and shoe sales increase. Needless to say, it can get pretty hectic! However, after the fifth day of Raya, the excitement starts to die down a little bit. You can wear non-traditional clothes or stop serving Raya food to guests if you wish. The first day of Raya, we eat traditional Malay food such as ketupat (ke-too-pat), rendang (ruhn-dang), sambal kacang (sam-bal ka-chang) and ayam masak merah just to name a few. Each state will have variations, but it is the same all around Malaysia. Ketupat or nasi impit are soft rice cakes that have been boiled for a few hours, with a hand-woven coconut leaf case. Because of the skill required to make the casing, ketupat takes longer to make. Therefore, many tend to buy versions ready-made from the market or use nasi impit instead. The skill is still practised in more rural areas of Malaysia though. Ketupat or nasi impit is best eaten with rendang is a dark-coloured spicy meat dish that originated in Indonesia. The smell is one-of-a-kind and aromatic. Seen here are rendang, ketupat, ayam masak merah, sambal kacang, and seronding. To cool and sweeten our palate, we treat ourselves to various kuih (dessert/pastries) that have been homemade or store-bought in the days leading up to Raya. Desserts may include tart nenas, suji, Almond London, other cookies, cakes and kerepek. In this modern day and age, you have just got to know where to get the best kuih to impress your relatives and friends. Eid is a grand celebration for Muslims all over the world to mark the completion of Ramadan, regardless of culture and customs. Even so, Eid has its special identity within a culture. 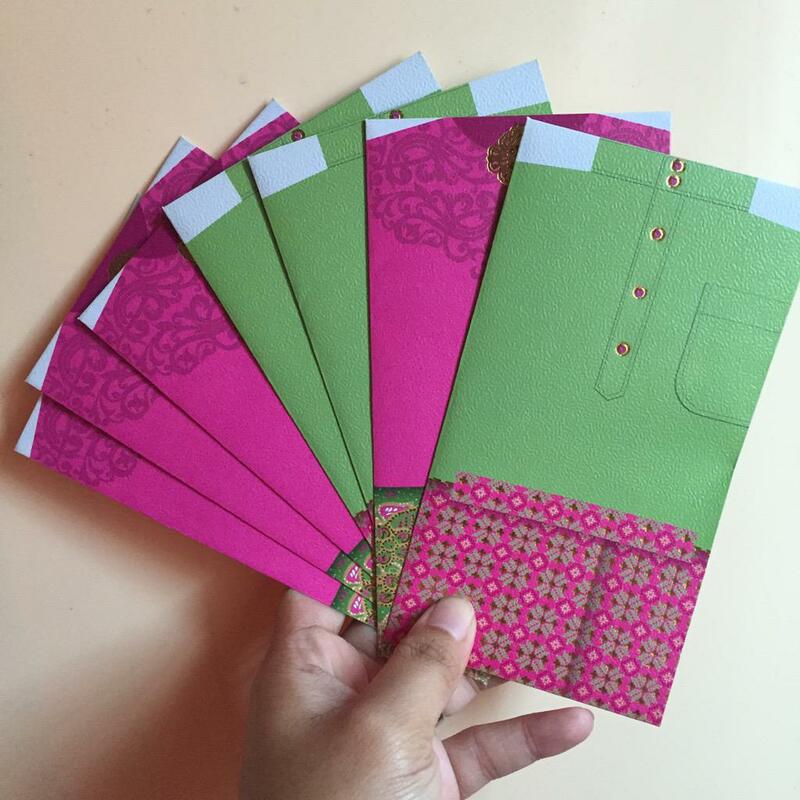 For example, in Malaysia, Eid is unique in such a way that it is identified by the food that is served, clothes that are worn, and most importantly, duit raya. How does your culture uniquely celebrate Eid? Only Opal cards from 1st of August!